What is propelling this new level of interest and excite¬ment around online learning? Can online learning really transform the learning process? 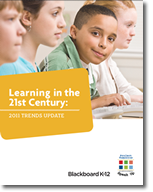 What is standing in the way of greater adoption of online learning in our nation’s schools? What are the most effective motivators to increase the pool of teachers who want to teach online?